Just kidding, of course they won’t meet about that. 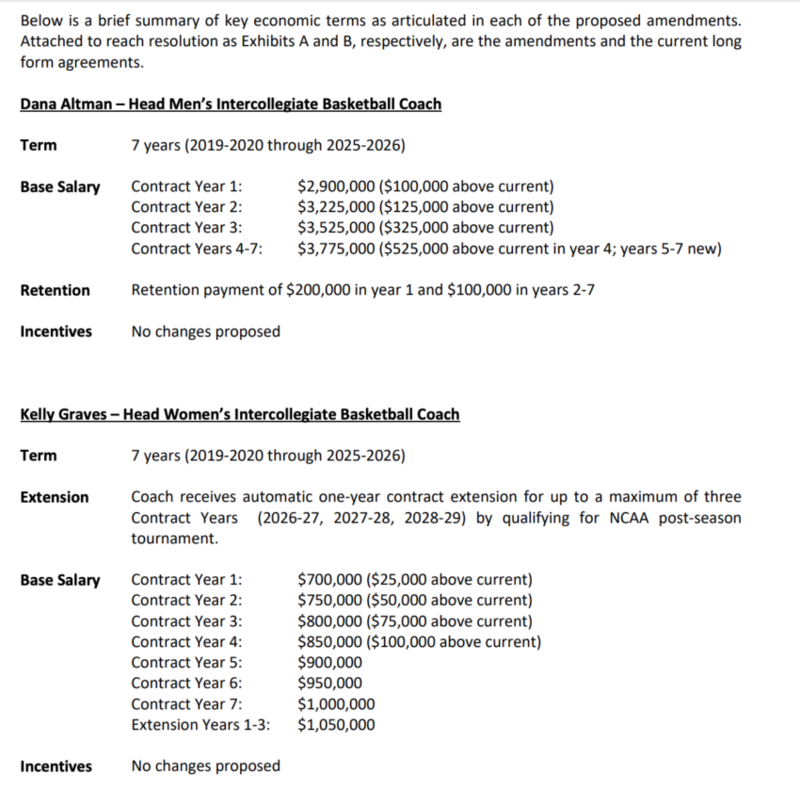 This is about our greedy basketball coaches. 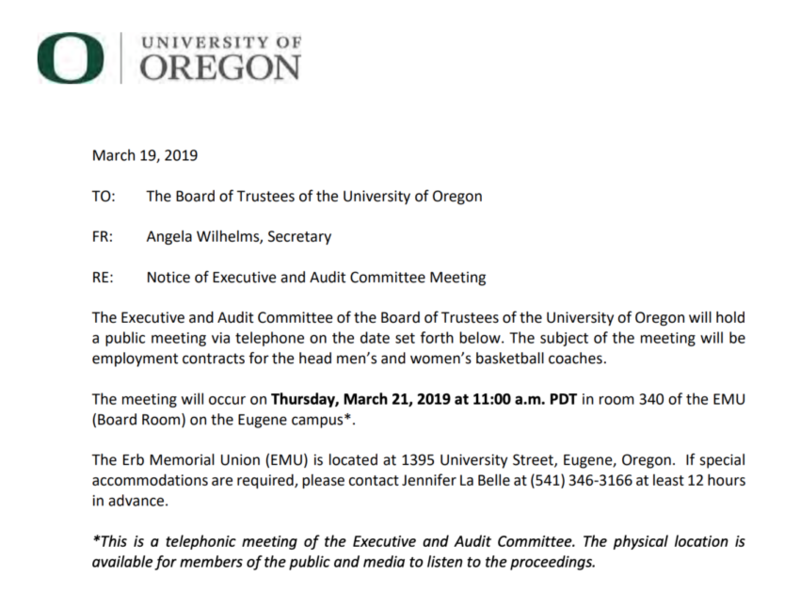 Two days after President Schill announced that UO is facing an $11M budget crisis which will likely lead to layoffs for instructors and OAs, our Board’s executive committee will be phoning it in on Thursday at 1PM, to give fat raises to Dana Altman and Kelly Graves. Full packet with contracts here. Tagged Dana Altman, UO Trustees. Bookmark the permalink. Usually the good ‘ol boys all get raises locked in right before the customary doom and gloom budget forecast during bargaining. A simple unforced error the Board will quickly correct. Sure, athletics is impoverishing the UO, in many ways. But that’s irrelevant. There’s no way to change anything for the better, as long as the UO remains a functional dictatorship. We need a democracy to structurally replace the Trustees and Johnson Hall. Until we make that happen, all the stories about administrative and institutional absurdities lead to nothing, except some ineffective complaining. I think it is rather idealistic to think the Board will even notice this connection. But, you were being sarcastic, right? Well, I can see why they want to lay off people who actually work on the academic side (SEIU, low level OA’s who should be classified, crap-paid instructors) AND squeeze our wages even worse (SEIU, GE). WOW! With some back pay! Wish we could retroactively get these kinds of increases! That’s $1,075,000 over four years IN ADDITION to the annual increases! No matter how you look at it, boggles the mind. There is NO way any classified staff or GE will see a 34.8% increase from their original wage 4 years ago. Nope. And there’s no way we’ll see a 34.8% increase from our current wages to those in four years. I leave the calculations for Kelly Graves as an exercise for the reader. Bargaining, even before economics, has been UGLY. The disrespectful changes they’re proposing are not only insulting but also punitive. Outrageous. We can expect the same or worse in their economic proposals, I’m sure.